Our first release in 2016 is a big one. If you're running an e-commerce site powered by WordPress, you're in luck! 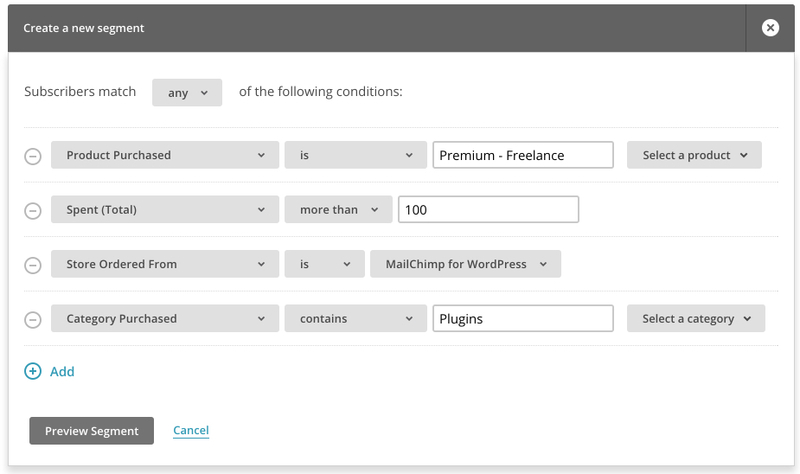 We're proud to tell you that version 3.1 of Mailchimp for WordPress Premium comes with complete eCommerce360 integration for both WooCommerce and Easy Digital Downloads. With Mailchimp's eCommerce360 functionality you can track visitors to your website from your email campaigns, capture order information and then pass it all back to Mailchimp. This allows you to view which of your email campaigns generated which orders and set up powerful list segments based on the purchase activity of your subscribers. The following screenshot shows just a few of the available options. These segments can then be used for any of your outgoing emails, like your regular email campaigns or for Mailchimp's Automation feature. Send an introductory series of 6 emails to people that purchased "Your Book". The plugin is capable of tracking all past orders, so there's no need to wait for new orders to come in. You can start right now! For more information, please see our knowledge base article on eCommerce360 and how to configure it (it's easy). The functionality described above doesn't just ping Mailchimp whenever an order is placed. We think this would unnecessarily complicate the checkout flow and slow it down for your visitors. Instead, the plugin is smart about it and processes all orders in the background. Whenever an order is created in WooCommerce, the plugin creates a task which will be picked up at a later time, usually within minutes. This means that the entire process of sending an order to Mailchimp is fully decoupled from your checkout. The performance impact is literally close to zero. Since eCommerce360 runs entirely in the background, we figured we needed a way that makes it easy to debug all this background magic. That's were the new Debug Log comes in. The log shows you what the Mailchimp for WordPress has been up to in your absence and what errors it encountered (if any). By default, the plugin will only log errors & warnings but our knowledge base has information on how to enable log debugging for all events. To start using eCommerce360, simply apply the available updates which should be showing in your WordPress admin panel. If you don't have an active license for the Premium plugin, you can get one here. What do you think about this new feature? We're pretty excited about all this - hope you are too. :) Don't forget to spread the word!